Hello everyone! To all of my followers, I know it’s been a long time since you’ve heard from me. I’ve been extremely busy this past year with the creation of my new small business & it has unfortunately kept me from doing any content for this website. Thankfully, now that I’ve gotten into a rhythm in my business, I’m back to share content with you once again. I will admit my content going forward will have a slight shift in focus. I will still be posting up baked goods as always, however they will be more nutritious in nature. As my life has changed to a healthier lifestyle, this website will have to change along with it. I hope you will all enjoy what is to come. I’m extremely excited to be back & I hope to expand this website even larger in the future…so stay tuned! For my first post back, I’m sharing with you the first healthy snack bar I ever created. The story behind this recipe coincides with the beginning of my journey to losing fat & getting healthier. At the time I started my journey, I did not have the finances to buy all of the fancy snack bars you find in health food stores, so what I did was I created my own from home. Later I would come to find out, as I became more educated in nutrition, that I wasn’t just saving money, I was also avoiding a lot of harmful ingredients that get hidden in processed health food products. So if you want to enjoy healthy snacks, even if you’re not on a budget, the best way to go is make them yourself. These chewy apple pie bars are the perfect make & take snack. They are freezable, gluten-free, vegetarian, & come together quickly. Taking only about 10 minutes of prep time, you can pop one in your lunch box or gym bag for a sweet snack on the go in no time. When you arm yourself with nutritious snacks, you can always keep hunger at bay! Line a 4 x 8 inch pan with parchment paper. Set aside. In a large food processor, combine the dates, apples, and walnuts. Process until a fine crumbs form, about 1 minute. Add the cinnamon, ginger, and nutmeg. Continue to process until mixture is very soft and easily holds together when pinched, about 3 to 4 minutes. Press dough into prepared pan. Cover and refrigerate for at least 2 hours, or until firm. Cut into 12 snack size bars (2 x 1¼ in. each). Wrap each bar individually and keep refrigerated (5 days) or freeze (1 month). Mornings are not my friend. In fact, I don’t think there has ever been a day in my life where I have been a morning person. Since I am most definitely a night owl, it only makes sense that I do not want to spend time in the kitchen making breakfast. To avoid skipping breakfast, which is the most important meal of the day, I whip up these amazing muffins on meal prep day. Then I have a quick and easy on-the-go treat that contains all the vital nutrients the body needs. On days that I do not have to be somewhere in the A.M., I will make a larger breakfast and enjoy these muffins as a post-workout snack. I know it is easy for the brain to be fooled by the word “muffin” that these little gems are not healthy, but do not compare processed, overly sweet bakery muffins to these. Each of these muffins only contains 149 calories, 1 gram of saturated fat, 2 grams of fiber, and 5 grams of protein. Oat flour stands in for traditional wheat flour, making each muffin gluten-free and lower carb. There is no refined sugar added for sweetness, only raw, organic honey, which keeps the sugar content very low (only 10 grams). They are even vegetarian friendly! I like to make a large batch and store in the freezer, that way they do not spoil and you can pull one out as needed and warm it up quickly in the microwave. Quick, easy, satisfying, and made with flavors of the season. Enjoy! Preheat oven to 400°. Line a 12-count muffin tin with paper liners. Set aside. In a large bowl, whisk together the flour, cinnamon, baking powder, baking soda, and salt. Add the walnuts and whisk again. In a small bowl, whisk the eggs, then stir in the milk, honey and yogurt. Add egg mixture to flour mixture and stir until just combined. Fold in apple and pomegranate seeds. Do not overmix. The mixture will be lumpy. Fill each muffin cup liner three-quarters of the way full with batter. Bake for 15 minutes or until a toothpick comes out clean when inserted in center. Let cool in tin for 10 minutes, then transfer muffins to a wire rack to cool completely. Happy Friday once again. Today was perfect for me as I did not have class. Le Cordon Bleu elected to give us Friday off instead of Monday for Columbus Day. With that said it was a short week for plating. We had two days to create two different plates meeting dietary guidelines of our choice. Some examples are Sugar Free, Low-Fat, Dairy-Free, etc. Although I have dietary needs myself (Lactose Intolerance) I opted for Vegan and Gluten free so that I can challenge myself. So let’s start with Plate #1..Gluten Free. What initially came to my mind when brainstorming for possible components was how much I miss ice cream being lactose intolerant. So I decided to make items that maybe would be missed by those with gluten allergies or vegans whose morals wouldn’t allow them to ever try such textures and flavors. Of course the obvious item that came to my mind for those with a gluten allergy would be cake. As this is culinary school I can’t simply make any ordinary cake so I made a Chocolate Kahlua Cake cut into proper portions with a round fluted cutter. To make the cake gluten-free, I used Rice Flour and Tapioca Starch to replace regular cake flour or all-purpose usually found in most cake formulas. I also added xanthum gum. The cake tasted delicious on its own but I wanted to add more components and give height to my plate utilizing the cake rather than an external component. To do this I made a White Chocolate Caramel Creme Anglaise which I poured over the cake and allowed to drip over the edge to give that warm, fresh from the oven look. 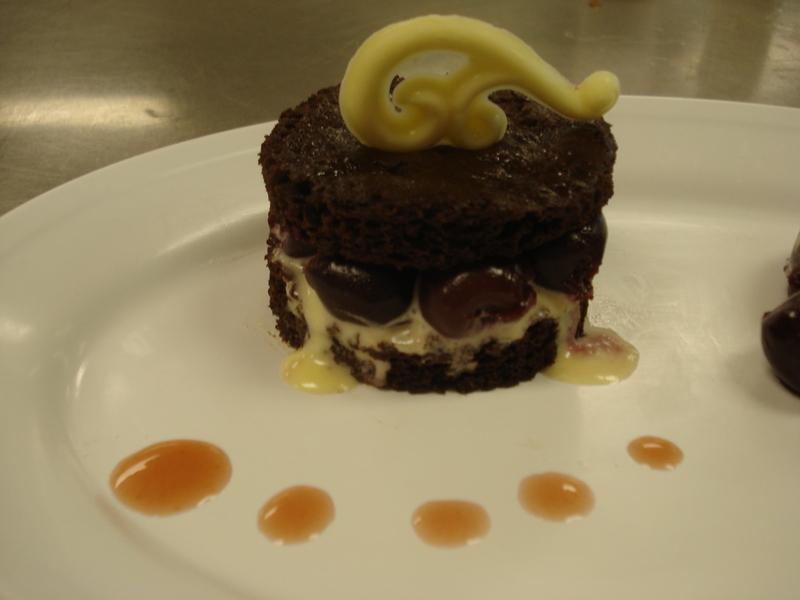 To add texture I placed cherries soaked in brandy over the creme anglaise and topped with another layer of cake. For added adornment and height, I tempered white chocolate and squeezed it into a mold using a baking squirt bottle to create the scroll. The decorative dots outlining the cake were created with a Cherry & White Peach Coulis. 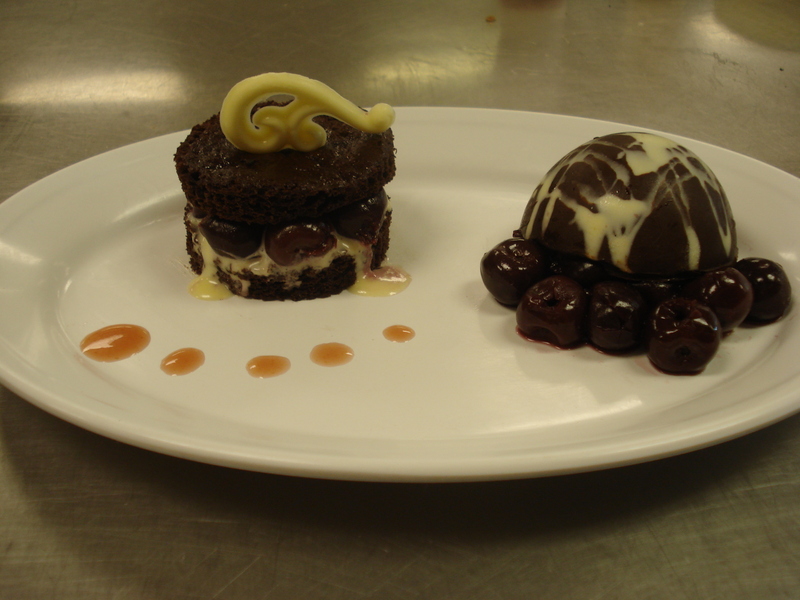 For the final component on of the Gluten Free plate, I created a two-toned chocolate bowl overflowing with cherries. To create the bowl, I used a round chocolate mold. Utilizing the already tempered chocolate used earlier for the scroll, I squeezed abstract lines around the bottom and sides of the mold. I allowed this to chill until firm in the refrigerator. Meanwhile, I tempered dark chocolate for the remainder of the mold. Once the white chocolate had hardened, I poured tempered dark chocolate over the streak of white chocolate until about 1/3 of the mold was filled. I then placed secured the second portion of the mold over the filled portion and allowed it to set up overnight to ensure it would be fully solidified. On the day of plating, I allowed the chocolate bowl to warm slightly, about 10 minutes at room temperature before attempting to remove it from the mold. This ensured the mold removed crisply without cracking. 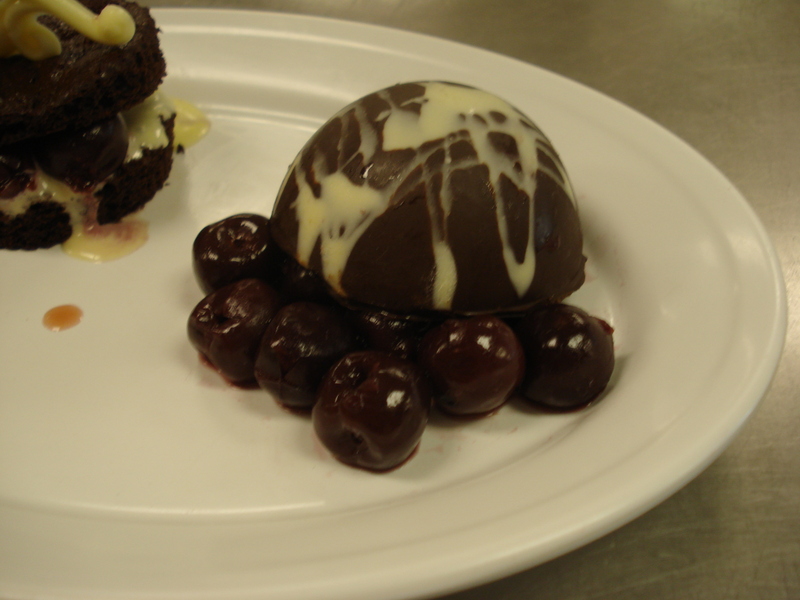 The bowl was then filled with the remaining brandy soaked cherries and tipped over on the plate to create a natural overflowing look. With the Gluten-Free Chocolate Kahlua Cake plate finished, it was time to move quickly on to plate #2…Vegan. Let me start by saying I have never in my career ever worked with anything remotely vegan except for the common organic fruit and vegetable. Items available to me such as Tofu and Agar Agar were new and I admit a tad bit intimidating. Despite the intimidation I pushed forward and ran for the exotic ingredients before the rest of my classmates used them all (our pantry is limited considering the large class size). The first item I snatched was oat flour and thankfully so as it was gone quickly following my usage and there was only one bag to be had in purchasing. 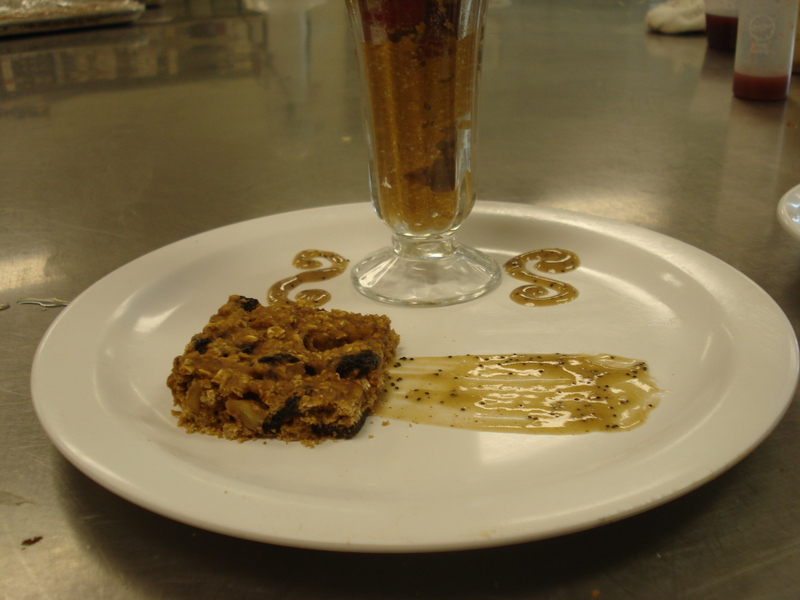 Since you are now aware of the main ingredient I’m sure you can almost guess what the bar is…. and if not it is Oatmeal Raisin sillies. Well Oatmeal Raisin Date Bars. Following Vegan dietary concerns, I made sure to plump my Raisins and Dates in Dark Rum free of animal additives used during fermentation. I also was sure to toast my oats in vegan imitation butter and sweeten with Agave. Once the bars were out of the oven and cooled it was the difficult task of cutting them into presentable squares. My largest complaint about the Vegan Oatmeal Raisin Bars is their texture. Even the slightest movement and they crack and shatter into crumbs. It was obviously fate that I made a larger pan then necessary to compensate for the amount I broke in the process of cutting. Finally I managed to get one decent square out of the bars and plated it right away before it shattered in the way of its predecessors. To attract the eye to the bar and add texture to the eye, I created a Banana Poppyseed Coulis which I fanned out from the bar and across the plate. The coulis consisted mostly of banana puree and agave to sweeten. For the final component and least favorite of all my plates so far is the Vegan Pumpkin Banana Mousse. The reason for such hatred between the mousse and I is its texture/consistency. My idea of mousse is a creamy, velvety yet heavily rich dessert that only takes a few spoonfuls and you are satisfied even though you could devour several spoons if given the opportunity to have a larger dish and scoop. This mousse met none of those requirements. The tofu imparted a distinct flavor and it didn’t fully incorporate with the pumpkin and banana puree, causing small pellets to form even after running through the robocoup (food processor) several times. Also the consistency wasn’t as firm as mousse typically is because it lacked the key volumnizing ingredient (heavy cream) and stabilizer/setter (gelatin). I did the best I could with this dish to be quite honest. I placed dollops in a nice parfait dish hoping to glamorize it somewhat. I layered fresh raspberries throughout to add color and a welcoming familiar texture. The parfait added height to my plate if nothing else, especially with the tempered dark chocolate adornment added to act as a straw. All in all I did enjoy the vast majority of the components on these plates despite the lack of typical ingredients I am accustomed to working with. You never realize how much heavy cream and eggs are in everything until you are told you can’t work with them due to dietary concerns! 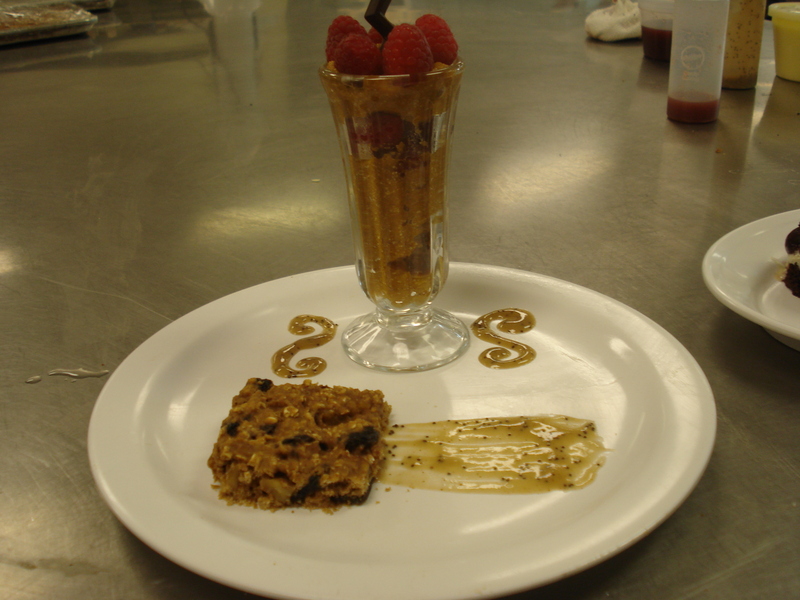 I did taste everything and it all tasted well in my opinion except for the mousse. If given the opportunity for a do-over I would replace only the mousse and maybe have made a vegan sorbet instead. I am thankful for the experience of working under dietary guidelines. It will forever be useful to my career and future in baking, especially with the large amount of people living with conditions, diseases, or religious beliefs requiring specific dietary needs. Following dietary guidelines is a must for every pastry chef and even novice baker ready to take innovation to the next level.